What comes to mind when someone mentions 5G? It’s a mobile technology, right? So, chances are the radio network will be your first thought. But we mustn’t forget something equally important. I’m talking about the core network, which, pun intended, will be central to achieving the exciting capabilities of 5G, such as end-to-end network slicing, allowing operators to offer a wide range of services with guaranteed Quality of Experience (QoE). The 5G core needs to be built with a cloud-native design that’s highly programmable, adaptable and agile. It must support a distributed architecture with placement of core functions closer to the edge to meet bandwidth and latency requirements. It will use microservices and containerization with open, programmable APIs that yield a more flexible, scalable and efficient multi-vendor network. The good news is that work is well underway to develop just this type of core. 3GPP Release 15 defines a new 5G core architecture that provides a multi-access anchor point to deliver seamless service over wireless, fixed or converged networks. This new 5G core uses a Service-Based Architecture that enables network functions to discover and interact with each other, for example, for flexible connectivity. 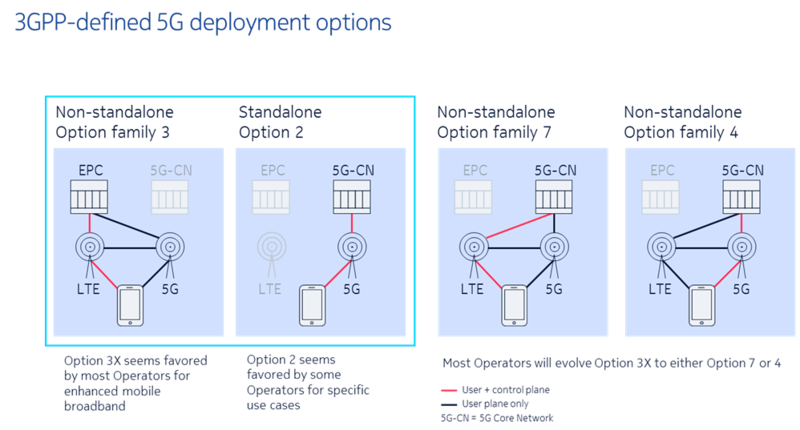 Operators have several deployment options for 5G. They can deploy a 5G core when they deploy 5G new radio (NR), or deploy it later, in a second step. 3GPP has defined a number of standards-based options for 5G, categorized as non-standalone (NSA, initially where the existing 4G core (or Evolved Packet Core) supports 5G and 4G radios) and standalone (SA where the 5G core supports 5G and enhanced 4G radios (eLTE)). Only after deploying a 5G core can operators offer 5G’s full set of new use cases and services. These can include services that rely on end-to-end slicing or a reconfigurable user plane that keeps latency low during a mobile data session. Nokia is at the forefront of developments, building the kind of agile core that will bring all the visions of 5G closer to reality. It’s even reflected in the name - Nokia AirGile cloud-native core. The solution is being continuously evolved and includes all the new 5G network elements and functions defined in 3GPP Release 15, such as core connectivity management, unified data management and policy control and charging. These are already commercially available or are very close to market. In fact, we’ve just launched four new components at the SDN NFV World Congress - the Network Exposure Function and the Cloud Signalling Director’s Binding Support Function, Network Function Proxy and Security Edge Protection Proxy. Check out this video in which Michael Clever, Nokia Senior Vice President and Head of End to End Cloud Solutions, explains how the 5G core is evolving. Making the most of 5G and using its potential to transform society will rely not just on new radio (which enables extreme mobile broadband), but also a 5G cloud-native core that together with 5G radios will allow ultra-reliable low-latency communications, massive IoT and enhanced mobile broadband. Let’s get going – with the right end-to-end solutions and determination to make it happen, 5G will work for everyone.